Obviously, I blame Facebook. And Twitter. If there’s a choice between composing a well-thought-out blog entry on a fascinating topic or posting a status line (Kate James is looking for something sequinned at the op shop to complete her Dolly Parton outfit for tomorrow’s party), the one-liner is going to win. Plus I don’t yet have a new book to flog. But here I am, at last, procrastinating so hard from working on the new book that I’m getting back on the bloggy horse. Hi y’all. So. Last year I went to India with Australia Council money for the potential book described in the last post, travelling from Ooty up the east coast to Kolkata, with a fabulous unscheduled break up in Darjeeling. Since I got back there’s been a lot of editing work available, which of course I’ve taken (the life of a freelancer…) and so the writing has been coming along very slowly. I’m nearly finished the fourth chapter, so what’s that, about a third of the way through? In other book-related news, I still don’t have a publisher. I’m working on it. Stay tuned. 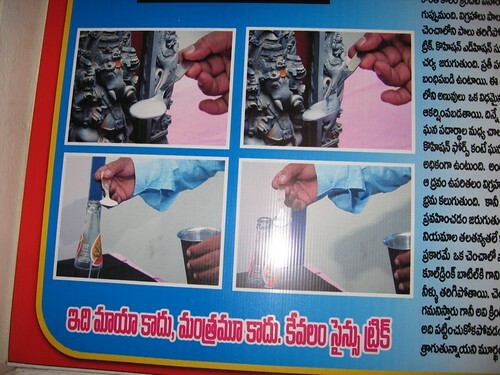 Seeing as I’m writing about the atheists at the moment, here’s a pic from the wall at their hospital; it shows that you can reproduce the effect of Ganesh miraculously ‘drinking’ milk with a bottle of yummy Slice mango drink. You are currently browsing the KateJames.net blog archives for February, 2010.